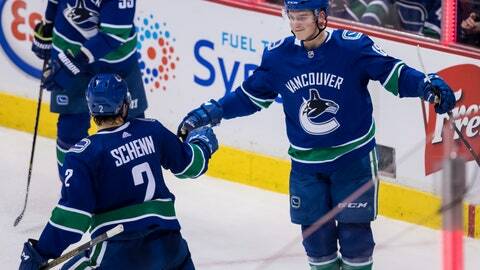 VANCOUVER, British Columbia (AP) — Getting some bounces on the power play helped get the Vancouver Canucks back into the NHL playoff picture. “Those weren’t the bounces we were getting earlier,” Horvat said. “We were getting those opportunities, they just weren’t going in for us. The Canucks’ first power-play goal came in the opening period, just 31 seconds after Ceci was called for holding. Horvat redirected a shot by Alex Edler for his 26th of the season. The second period was just 32 seconds old when Pearson put the Canucks up 2-0. Defenseman Alex Biega lifted a pass high into the Senators’ end. Pearson swatted the bouncing puck past Anderson. Vancouver coach Travis Green said he wasn’t worried about Ottawa’s late rally. “They threw some pucks at the net, pucks went in,” Green said. “I thought we were still in control of the game. NOTES: Pettersson received a standing ovation in the first period for breaking the Canucks’ record of 60 points in a season by a rookie with an assist in Chicago on Monday night. . Boeser has nine points on a career-high eight-game scoring streak (three goals, six assists). … The Canucks opened a stretch of seven games at Rogers Arena, their longest homestand of the season. . Vancouver last won three straight games Dec. 6-11, with victories over Nashville, St. Louis and Columbus. . Ottawa’s Thomas Chabot, who has missed the last two games with a broken toe, is expected to play Saturday in Edmonton.